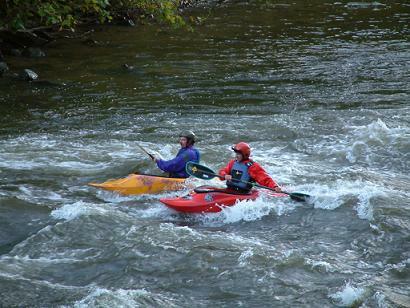 Our kayak instruction program is headed by 9 time National Canoe Champion Mark Clarke. Our instructors have years of paddling and teaching experience and are certified by the American Canoe Association. Your safety and enjoyment are their primary concerns. Whether you're a complete beginner or an experienced paddler, we can help you get more out of this exciting sport. 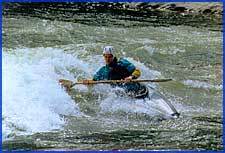 Our Whitewater Instruction program is headed by Mark Clarke, a certified American Canoe Association instructor. Mark is an eight-time Open Canoe National Champion and is a nationally ranked kayaker. Mark has many years teaching experience and makes your safety and enjoyment his primary concern. Classes are kept small, with usually four or five students per instructor. We emphasize personalized instruction to fit your style. Lessons begin at 10:00 am at our shop and end at approximately 4:00 pm. All equipment, local transportation and lunch is included. Beginner Lessons start on a quiet local pond where we work on basic strokes and becoming familiar with your boat. After taking a lunch break (lunch provided) we return to our boats to paddle an easy stretch of the Housatonic river for the rest of the afternoon. No experience is necessary but you should know how to swim. We offer lessons for paddlers of all skill levels. Whether you wish to make paddling a major part of your life, or simply wish to try it out, we can help! $125 per person, for semi-private lesson (3 person min.). $250 per person, for a private lesson. Eskimo Roll Lessons are $45 per hour, min. 2 hours. Equipment is not provided. A 50% deposit is required when you sign up for a lesson. Fully refundable with 5 days cancellation notice. Private or semi-private lessons will be scheduled at your convenience. Please reserve 2 - 3 weeks in advance. 163 Route 7, West Cornwall, CT 06796 DOES NOT WORK FOR GPS!